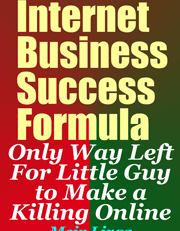 Here's the Only Way Left for the Little Guy to Succeed in an Internet Business and Make a Killing Online. You may be wondering who am I and what qualify me to teach you how to succeed in an Internet business. Well, My name is Meir. You may have stumble on my name on the internet, probably in relation to my activities as a writer and publisher of business guides. This is just one side of me, the visible one. There has been another side to my online presence, a concealed one, as a leading player in the internet marketing arena. As I don't believe in theories and opinions, I've tested dozens of ways and strategies of making money online. Some proved to be successful while others bombed (and served me well as learning experiences). I must've been doing something right as I managed to accumulate along the way a seven figure fortune. The bottom line is that I've come up with a simple most effective strategy of making money online, as a matter of fact this strategy made me a millionaire - in this book I'll show you exactly how it works so that you too will be able to make tons of money online. In order to make money online you must go off the beaten path, you need to do something different, you need a competitive edge - and that is where the strategy presented in this book comes into play. This guide will give you that "unfair advantage" to boost your sales, pile up profits and leave your competitors in the dust. Are you ready to make loads of money online now? just click on the "Download" link above!